It’s amazing when you see something special for the first time that’s been there your whole life. I’m a lifelong Southeastern Massachusetts resident, have been in and around and flown over Boston a zillion times, but it took a friend visiting from Oregon several years ago to show me, for the first time, Boston’s Granary Burying Ground. I mean, it’s only the final resting place of people like Samuel Adams, Crispus Attucks, Paul Revere, and John Hancock. Who knew? I didn’t. You could’ve knocked me over with a quill feather. Same with World’s End in Hingham, a property of The Trustees of Reservations, based in Sharon. I’d heard about it many times from people, including a former Globe editor and Hingham resident who gushed about the place, and, believe me, she wasn’t the gushing type. So one recent glorious Sunday afternoon, I went to World’s End, chatted a bit with Tom, the wonderfully informative entrance attendant and retired South Shore schoolteacher, and headed off to check out what the World’s End buzz was. I have never had three-hour goose bumps before, but the minute I took a left past the Damde Meadows tidal marsh and cut down to the rocky beach to start a long hike, the goose bumps started, and never abated all afternoon. Simply put, World’s End blew me away — mostly the views, but also the history, the story of its geologic creation, everything. 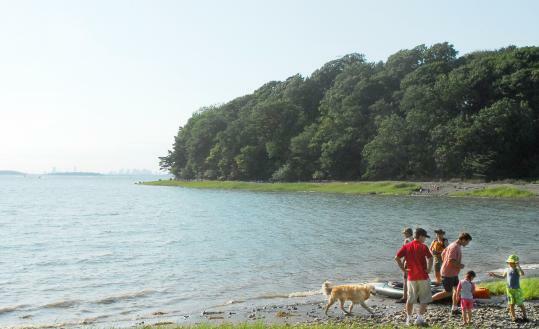 I walked over a beach of stones smoothed by endless tides, avoiding the trails for the time being and just inhaling incredible views: near ones of Hingham Harbor’s homes and boats, and Boston’s skyline shimmering in a summery haze 15 miles away. I walked a full mile along the rocky shore, stopping to sit and look far more often than I usually do on such jaunts, shucking shoes to wade into the small, lapping waves. I made it to The Bar, a thin strip of land connecting Planter’s Hill and World’s End proper, with Hull on one side seemingly close enough to touch. Here families played on the shore, dogs splashed in the water, kayakers put in their watercraft, people sat and sunned and read, a group of youths engaged in a study project, and hikers like me set out for more magic. It wasn’t hard to find. I headed straight up a steep, grassy hill and onto the most gorgeous, wide-open trail I have ever hiked — massive, old trees framing either side, arched branches interlocking above to form a shady canopy, a good mile-and-a-half of easy walking. This is one of the Trustees’ most popular holdings, and though the parking lot was jammed I felt as if I had the whole place to myself, spotting the occasional other hiker stopping to drink in the Hub views on one side or Hull on the other. I headed back to The Bar, up a thigh-burning hilly trail through Brewer Grove (named for the land’s former owner, John Brewer) and onto Planter’s Hill, where the best views of Boston can be had atop a 120-foot grassy cap. It’s a great place to sit at a picnic table, relax and ruminate about how this place most beautiful almost wasn’t. In 1889, Brewer commissioned Frederick Law Olmsted, creator of Boston’s Emerald Necklace park system, to design a housing subdivision of 163 lots connected by carriage roads lined by newly planted trees. The development fizzled, and those tiny trees are now the huge ones framing roads that now serve as wide, grassy trails. In 1945, World’s End was considered for the site of the United Nations headquarters, which eventually went to New York. In 1965, there was a proposal to build a nuclear plant here. Luckily, The Trustees of Reservations acquired the property in 1967 and it remains blissfully untouched, a sprawling, hilly hunk of conservation land comprising four coastal drumlins created by retreating glaciers, with saltwater marshes, meadows, woodlands, and granite ledges covered with red cedars and thickets of blueberry, and hilly fields maintained to provide habitat for grassland-nesting birds, as well as native plant species. And I swear there isn’t a single spot in all of it that isn’t simply stunning in its beauty. They say in fall it’s even more incredible, and in winter is a splendid place for cross-country skiing. Three hours of jaw-dropping sights, right here in our own backyard? Who knew? Check out World’s End at www.thetrustees.org. Paul E. Kandarian can be reached at Kandarian@globe.com.